Our high quality flail mowers and mulchers are designed to enhance cut performance for pasture improvement and maintenance. With over 30 years experience, buy from us and you can buy with confidence. We offer a wide range of quality agricultural machinery, mulchers, flail mowers, finish mowers, verge mowers & slashers at the competitive prices. 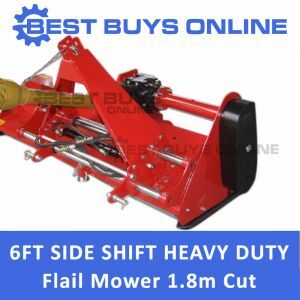 RELIABLE: This side-shift flail mower is fitted with hydraulic offset makes it possible to cut close to field boundaries or work around posts, trees. 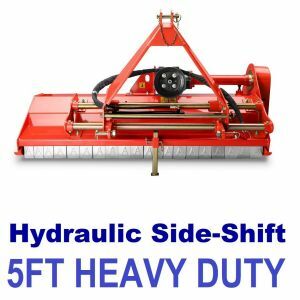 Features a hydraulic side-shift, it can also be positioned directly behind the tractor. This is perfect for transport and for manoeuvring around any obstacles. VERSATILE: The sturdy compact structure has a heavy gauge balanced rotor, mounted on self-aligning bearings for a wide range of applications. DURABLE: The heavy duty skids and soild construction are ideal for operation on hard terrain. Equipped with hammer blades, these flail mower make short work of even the toughest grass, grapevine shoots and bracken. SAFETY: Protection flaps in front of mulcher provide safety for you and your tractor against stones. They hold back objects and reduce damage to the flail mower. Best of all, it will provide trouble free service at a super competitive price. 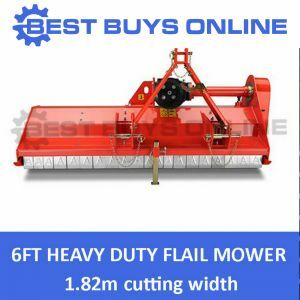 Designed to meet Australian Standards and imported by one of Australia's most reputable companies, you can rely on our range of flail mowers. GRASS/ LAWN MAINTENANCE: The Hydraulic Offset Flail Mower Mulcher is a robust machine designed for heavy grass cutting, clearance of small trees or bush in larger areas, roadside verges or general farm areas. PASTURE IMPROVEMENT: It is also an ideal option if you are looking to regenerate your pastures and the overall soil health of your property. They can manage heavy grass and stubble, provide a beautiful finished cut and help improved the overall health of the land. If your budget allows these machines are the perfect solution all round.